All original sprites are made by Hat-Loving gamer and level Up. These were uploaded with permission from the original creators. Well that's how the series is. The original creator (Hat-loving gamer) is not much of a Mario fan so don't expect characters from the Mario universe out side of Mario Luigi Peach and Bowser. That's how they are, I didn't find or rip the original Mario and Luigi sprites so don't blame me. Most of the sprites were edited with those sprites in mind. nice! can you also rip bowser custom sprites from the series too? ladies and gentlemen, this is the first and last time you will ever see power rangers on this website. It's to late in the series to change sprites. I apologize for the inconvenience. I'll consider making more "accurate" sprites in the future. But please understand that a ton of effort went into these sprites. Don't quadri-post Guscraft 808 Beta 2.0, it creates an unnecessary flood. He's right, though. The sprites used as a base are one pixel thicker on the left side than how they are supposed to be. 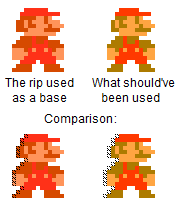 Also, the color used for Mario's facial features, his overall and his shoes, is wrong.